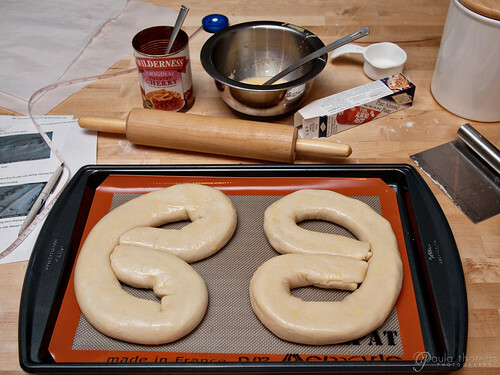 This week for my Food A-Z project I decided to do a Danish Kringle for my "K" food. 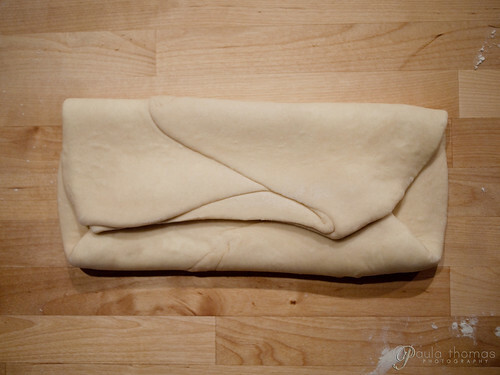 I've never really made a pastry before so this was new to me. I must have read the directions about 15 times before starting. I used a modified version of a recipe I found on TriniGourmet.com. I made the following changes: used different fillings, chilled dough before rolling it out, increased the final rise time, added a glaze after baking and used toasted almonds. My new butcher block counter top had its work cut out for it today. Come join the fun at the My Baking Addiction and GoodLife Eats Holiday Recipe Swap sponsored by Red Star Yeast. 3. Soften yeast in 1/4 cup of 105-115 degree water. 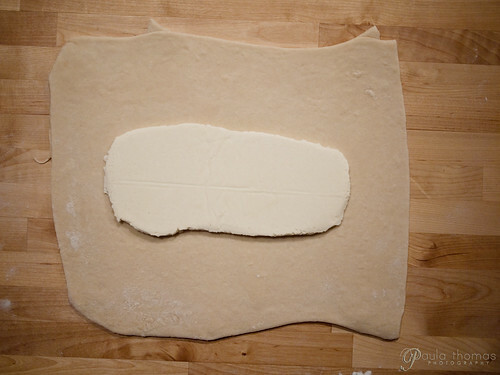 6. overlap sides of dough atop butter. 8. Repeat folding and rolling twice more. 9. 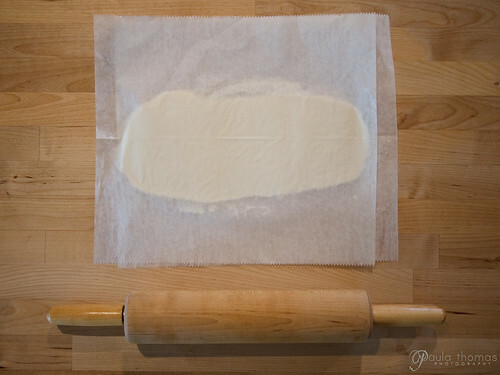 Wrap in waxed paper. 11. Roll to 24×12 inch rectangle. 13. 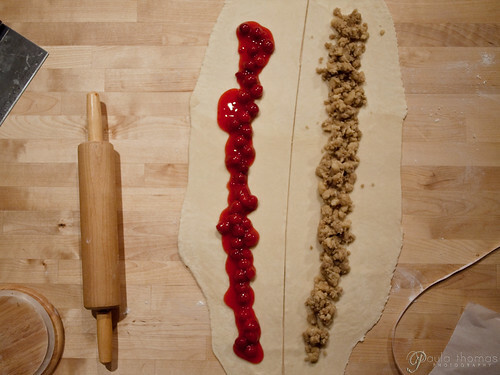 Spread each with Filling of your choice and roll as for jelly roll, starting with long side. 18. Brush Kringles with beaten egg. OMG OMG OMG OMG OMG OMG OMG OMG OMG OMG!!!!!! 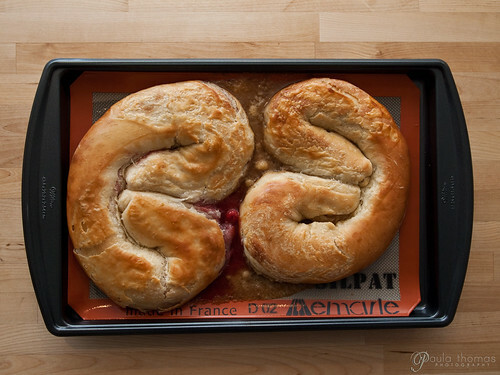 I HAVE TO MAKE THIS BEAUTIFUL DANISH KRINGLE! THANKS! Hi Paula, Thanks for the comment on my flikr page:-) Imagine stopping by your blog and finding that you referenced a blogger from my country for these gorgeous kringles. The first comment by Vero leaves me with little else to say about those pastries. I am about to try this recipe...I hope it is as good as it looks, your recipe is one of the few out there that actually is laminated! Good luck with the recipe. It's very time consuming but well worth it! I just made this today using your variations from the TriniGourmet version and it is FANTASTIC! I did one apple, using homemade apple pie filling, and one almond. The glaze and almonds on top are such great compliments! Looks great! 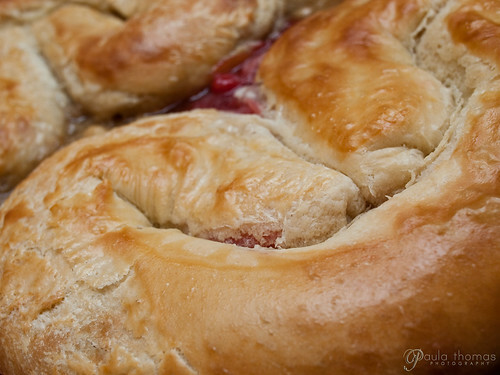 One of these days I'll have to get around to making kringle, especially since I'm Scandinavian! 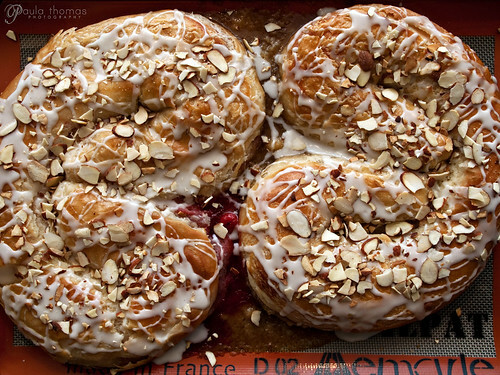 In the meantime it's just too easy to get a delicious almond- and raisin-filled one from a local Scandinavian bakery. Good work!